Images of Pluto’s tiny moon tiny Kerberos taken by NASA’s New Horizons spacecraft – and just sent back to Earth this week – complete the family portrait of Pluto’s moons. 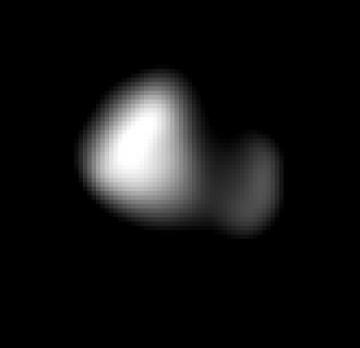 The new data, downlinked from the New Horizons spacecraft on Oct. 20, show that Kerberos appears to have a double-lobed shape, with the larger lobe approximately 5 miles (8 kilometers) across and the smaller lobe approximately 3 miles (5 kilometers) across. Science team members speculate from its unusual shape that Kerberos could have been formed by the merger of two smaller objects. 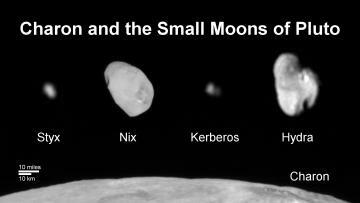 The reflectivity of Kerberos’s surface is similar to that of Pluto’s other small moons (approximately 50 percent) and strongly suggests Kerberos, like the others, is coated with relatively clean water ice. Before the New Horizons encounter with Pluto, researchers had used Hubble Space Telescope images to “weigh” Kerberos by measuring its gravitational influence on its neighboring moons. That influence was surprisingly strong, considering how faint Kerberos was. They theorized that Kerberos was relatively large and massive, appearing faint only because its surface was covered in dark material. But the small, bright-surfaced, Kerberos now revealed by these new images show that that idea was incorrect, for reasons that are not yet understood.